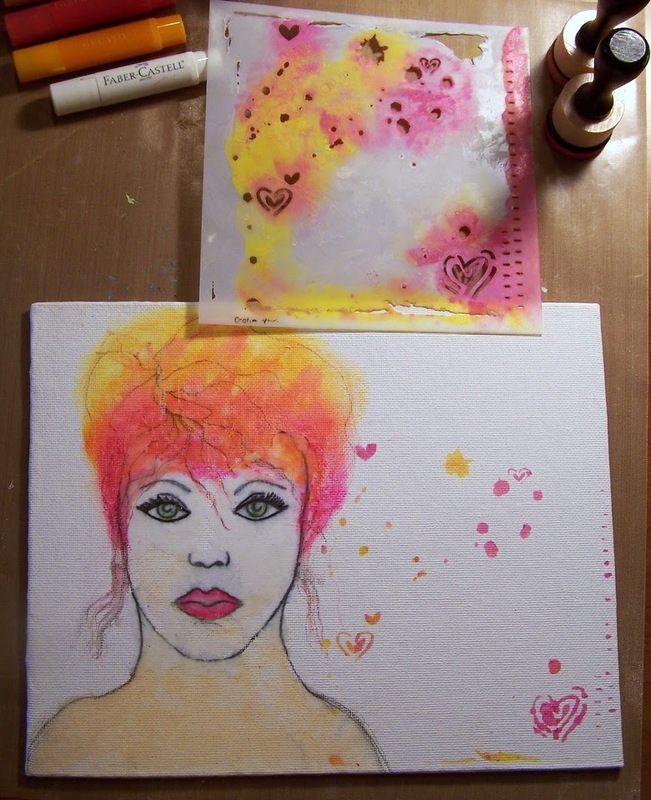 Hello, it's Sue Lelli here today to show you how I was inspired by none other than Donna Downey! I took a class from her not knowing we would be working with faces ~ NOT my thing! I spent most of the class frustrated because I couldn't even do the first step which was a new technique (for me) called image transferring. So what did I do? I followed all of the rest of her steps, learned as much about technique as I could, ended up with something I was sort of pleased with - but only honestly because Donna was kind enough to help me plus give me encouragement. That might have been the end of the story but I was determined to try it again. 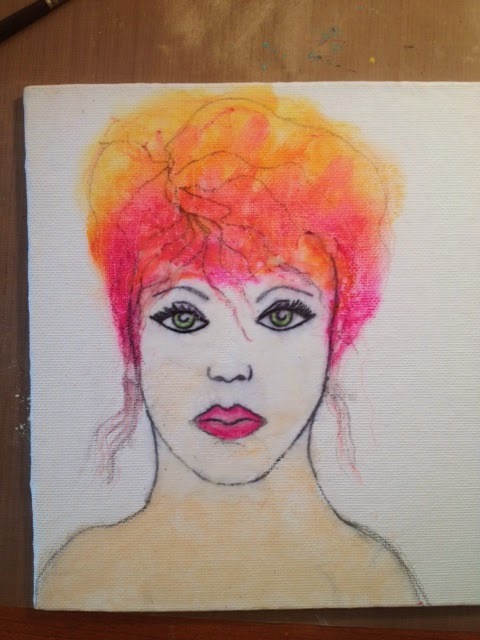 My artist friend, Maria, drew a face for me to keep and use and I tried the image transfer again. Tah! Dah! Here is my canvas ~ inspired by Donna Downey! I used words from the TCW mini Art is stencil to create my message. Wendy Vecchi's black embossing paste did the trick. "Art is just color and shape, feelings and experiences"
At the bottom I added "release and surrender" to remind myself to just let go and try new things with my art, even if it's uncomfortable! 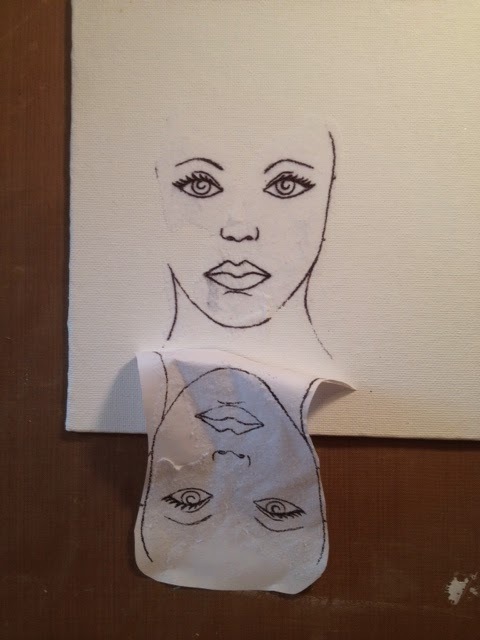 This shows the image transfer with the face my friend drew. You will probably be seeing this face again! Next I used gelatos in several colors and sprayed it with water from a mini Mister, and then mixed it around with my fingers. I used gelatos to color her face, neck and hair. I then added definition with Prisma watercolor pencils. Thanks, Donna, for literally showing me how to on my class piece! I colored the eyes and lips with the Prisma pencils as well. 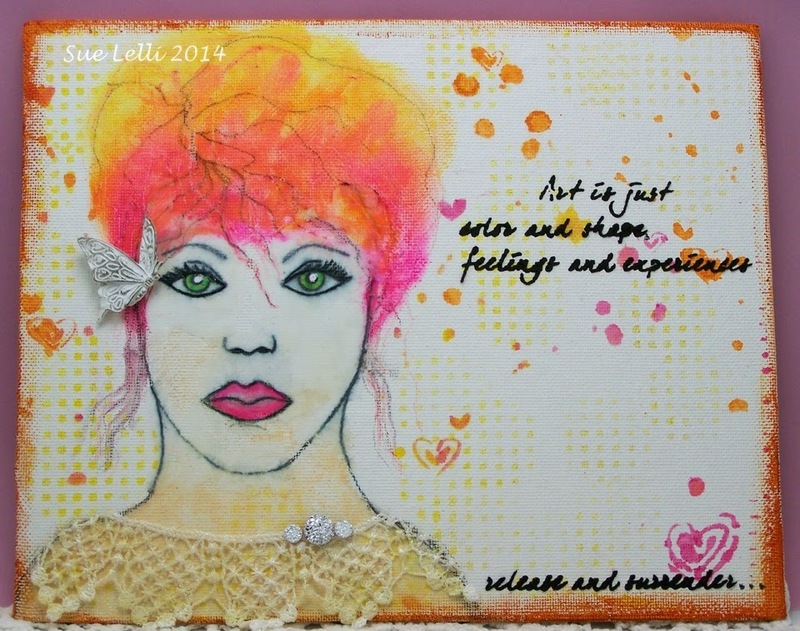 Next I made a background using my FAV TCW confetti stencil and Tim Holtz Distress paints in shades of pink, orange and yellow. 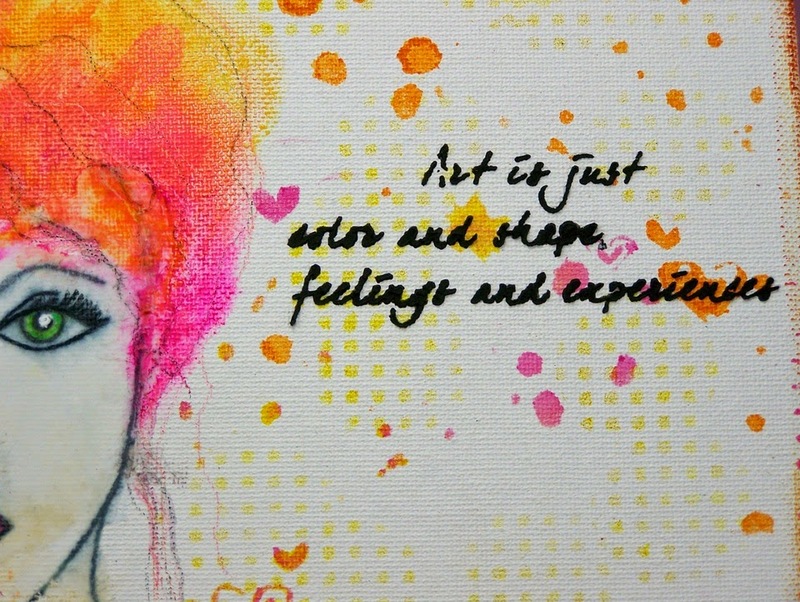 Then I used the Dina Wakely plastic canvas stencil ~ LOVE ~ to add some more color to the background. 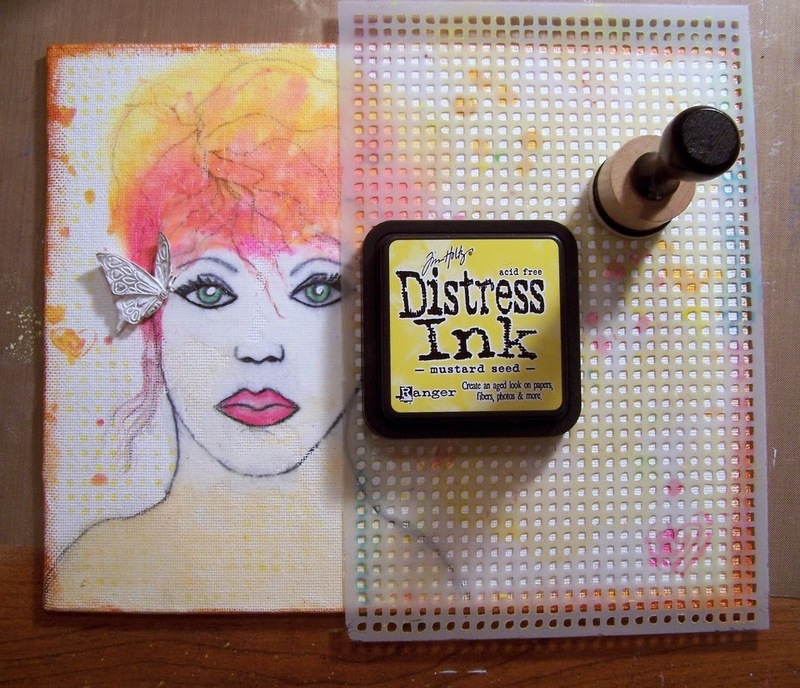 I pounced Tim Holtz distress ink in mustard seed with the mini ink blending tool. I rubbed golden paint around the outside edges, added a Prima resin butterfly, a little lace, and considered it done! I absolutely love that hair!!!!! Awesome journal spread and I will tell you that I have days when I can't draw a face no matter how hard I try and then there are days when drawing a face comes easily. Love this!!!! Nice job on this Sue! I had the same issues with the face class with Dina Wakley - SO HARD!!! but tracing is a very valid way of doing it as well and this came out lovely! Love the hair and the lacey collar! Beautiful piece. How did you transfer the face...just tracing? Good for you Sue...don't give up when you step out of your comfort zone!!! The butterfly in her hair is adorable and I LOVE how it pops off the canvas. The color you chose for her eyes is STUNNING.